Before 2018 National Planning Conference sessions, workshops, tours, and receptions began, APA leaders gathered in New Orleans for a series of leadership meetings. All APA leadership groups have been busy, and each one had a very full agenda. On Thursday, April 19, the Leadership Plenary included panel discussions of component leaders and staff. The staff panel discussed the process for developing programs and ideas through our research, education and communications activities. The leadership panel discussed how chapters, divisions, student organizations and AICP can excel in contributing to member value. This was followed by a reception of the Board of Directors, AICP Commission, Chapter Presidents Council, Divisions Council, and Student Representatives Council to discuss items of interest in the planning field. Also on Thursday, at the AICP Commission Business Meeting, the Commission approved goals for CM program, and is moving forward to assess the program during 2018. The Commission also approved a schedule for the next certification exam update, a process which will kick off this summer. 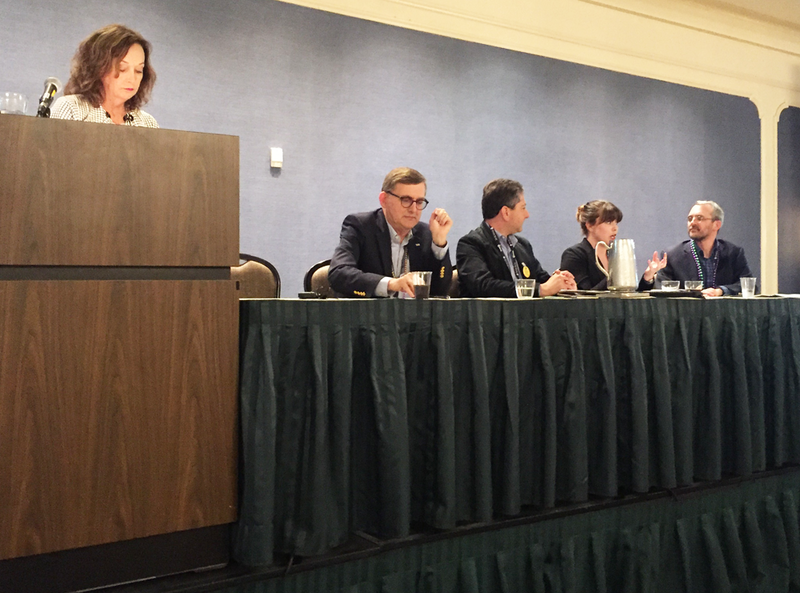 APA leadership panel: (from left) Mary Kay Peck, FAICP; Glenn Larson, AICP; David Fields, AICP; Rachael Thompson Panik; and Ben Hitchings, FAICP. Photo by Mike Welch. At the Board of Directors Business Meeting on Friday, April 20, held at the Hilton Riverside, the board discussed new approaches to our organization’s strategic planning process, and considered new ways to gather input from APA’s component leaders. The Chapter Presidents Council Business Meeting was held on Friday at the Hilton Riverside, and looked at ways to advance the implementation of Chapter Performance Criteria; and discussed ways that APA and the council can ensure that chapters have adequate administrative support. Division leaders are utilizing innovative strategies to engage record numbers of new members and students joining APA's 21 special interest groups. A new action-oriented work plan identifies opportunities and goals for Divisions to serve as the "go-to" subject matter experts on their topical areas. At the meeting of the Student Representatives Council Executive Committee, the student leaders discussed revising the student governance structures and talked about ways to make Planning Student Organizations at planning schools more effective. Many thanks to our volunteer leaders for giving their time to APA. Top image: APA leaders before Thursday's leadership plenary. Photo by Linda Reineke, Riverview Photography. Mike Welch is APA's director of leadership.